life "with God." As we read Scripture, we should consider how exactly God is "with us" in each story and allow ourselves to be spiritually transformed. By opening our whole selves--mind, body, spirit, thoughts, behavior, and will--to the page before us, we begin to grasp all the Bible has to teach about prayer, obedience, compassion, virtue, and grace and apply it to our everyday lives to achieve a deeper relationship with God. 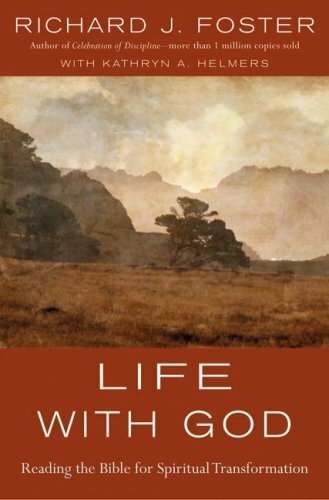 With a wealth of examples and simple yet crucial insights, "Life with God" is an indispensable guide to approaching the Bible through the lens of Christian spiritual formation, revealing that reading the Bible for interior transformation is a far different endeavor than reading the Bible for historical knowledge, literary appreciation, or religious instruction. Richard J. Foster is the author of several bestselling books, including Celebration of Discipline , Streams of Living Water , Life with God , and Prayer , which was Christianity Today 's Book of the Year and the winner of the Gold Medallion Award from the Evangelical Christian Publishers Association. He is the founder of Renovarï¿½, an organization and a movement committed to the renewal of the church of Jesus Christ in all its multifaceted expressions, and the editor of The Life with God Bible .